How to select your mechanical equipment screening. A user’s guide for assisting in design and selection of materials. The intent of this guide is to provide an easy step-by-step process to help you decide when you may need mechanical equipment screening. Once you know there is a need, this guide will provide you with a general design and assist you in selecting the best choice for materials. PalmSHIELD has been working with architects, engineers and designers across the United States for over twenty years. We have learned a great deal from these professionals about complementing the building and blending in our screening. Mechanical equipment may include any device in the support of water supply, electricity, heating, cooling, and waste management. It may include compressors, condensers, chillers, HVAC, compactors, breakers, meters, containers, generators, and like-kind equipment. Trash dumpsters may or may not fall under this category as many communities have very specific location and screening requirements for trash equipment. All mechanical equipment screening will require a building permit and, often, community design approval. Please check with your local building inspector or city planning for approval process requirements. Typically, a building permit is accompanied with an architect prepared set of design drawings in compliance with the community’s mechanical equipment screening requirements. Most communities have very strict guidelines regarding mechanical equipment screening. These guidelines will address public view considerations, selection of materials harmonious with the surrounding building and overall design. Guidelines will utilize a line of sight approach to the location, coverage and height of screening. Of course, our how-to-guide and selection assistance should not supersede these community requirements. Mechanical equipment screening is typically respective of two types of installation: Roof and building mounted and ground mounted. Building materials, color and scale. The screening must be compatible with the building structure. If the roof lines are visible and vertical, the designer should consider vertical louvers or slats in their screening. Line of sight. The designer should consider his screening respective of all possible views of the equipment. If the building happens to be adjacent to an elevated road surface, the designer may have to consider a fully enclosed screen system with a roof. If the building is several stories tall, the rooftop equipment may not be viewed from any vantage point thus not requiring screening. Please consult your local code. Mechanical equipment. The mechanical equipment itself should be considered. It may not be practical to screen all equipment due to proper ventilation, space, height, etc. In that event, the equipment itself may need to be painted to match the surrounding building surfaces. Some stacks must be tall enough to achieve a proper draft. These can be framed-out with like-kind building materials. Stand alone systems. These systems are the most challenging. Though the choice of screen is less limited; blending the screening into the surroundings is very difficult. Designers should consider the use of greenscapes and hardscapes to complement the system and soften its appearance. Screening colors may be more representative of softer greens and browns to blend in with these softscapes. Public view. Ground mounted mechanical equipment is generally visible by the public on at least three sides. Designers should give consideration to assuring that the equipment is fully enclosed, planning for any future development of the property. Security and safety. Ground mounted mechanical equipment screening should be designed to provide total security, preventing the public from accessing the equipment accidentally or intentionally. Be sure the mechanical equipment screening is tight up against the building, removing any shortcuts for pedestrians. The equipment screening should include a padlock free locking system, not allowing intending thieves to simply cut the lock and remove any valuable materials such as copper. The screening should be tall enough not only to allow any line of sight views to remove any temptation for theft. Some mechanical equipment will generate steam, heat and exhaust. Designers should give consideration of sizing the screening not only for proper ventilation but to assure public safety from burns and fumes. Soft scapes. It is common for landscape architects and designers to plan for softscapes around mechanical equipment. These softscapes may serve as the screening itself or soften existing mechanical equipment screening. Designers should give consideration to year around plantings and climate changes. If the plantings drop their leaves in the fall, you may be left with an unsightly view of the mechanical equipment or screening. Consideration should also be given to continued growth of the plantings and space to maintain these plantings. As some of this equipment will generate heat, exhaust or steam, designers should consider resilient plants that can survive even a slight change in conditions. Reflective sunlight from the equipment and screening can also be hard on some plantings. Structural. 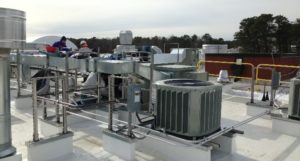 Not all mechanical equipment screening is designed to be standalone or to be located on a rooftop. Architects and engineers should calculate the wind loading on the screening respective of their site conditions. Select only screening that is engineered to meet the latest UBC and IBC codes respective of your site conditions. You should request this engineering or request that the system be engineered to your site, receiving a set of stamped engineered drawings, calculations and performance data. Visibility. 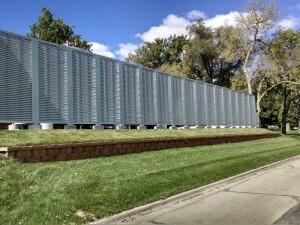 Louvered mechanical screening can be modified to any degree of visibility that you select. Most louvered mechanical equipment screening is either 100% or 80% A 80% openness will allow about a ½” visible opening between the 4” tall louvers when looking straight-on. Twelve foot tall PalmSHIELD louvers protecting the mechanical equipment at the University of Nebraska Medical Center. Openness. The direct visual screening percentage is directly related to the percentage of openness. The percentage of openness is the actual opening between the louvers over a specific area. The smallest opening between two louvers is the greatest factor impacting the percentage of openness. A 100% direct visual screening 4” tall louver with a ½” overlap will have a 2 ¼” opening. 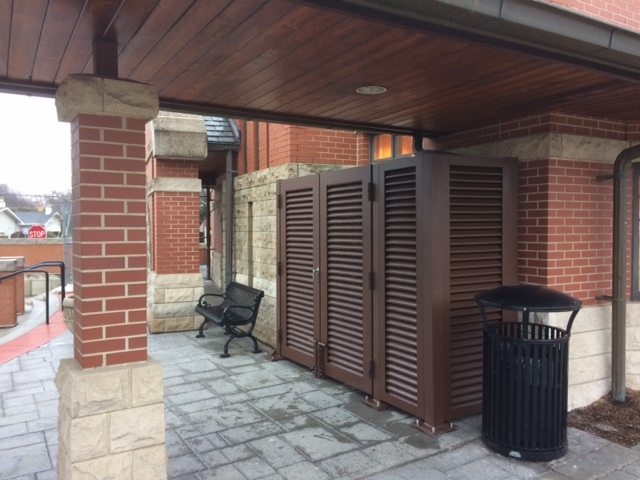 In other words, with 4” tall louvers spaced 3 ½” on center results in a 2 ¼” opening. Boiled down, every 3 ½” of travel, there is a 2 ¼” opening. This ultimately translates into approximately a 64% free area. The free area determines the volume of air that can be exchanged between the louvers. Designers should check their equipment requirements for the percentage of free area. Louvers. The most widely used mechanical equipment screening is louvers. 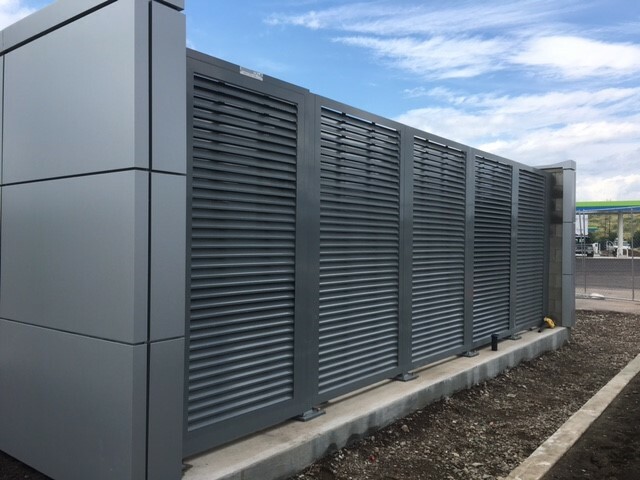 Louvers are available in vertical, horizontal and diagonal. Louvers may be spaced such to allow more or less visibility between the louvers and opennes. Perforated metal. This perforated sheet steel is available in varying patterns, hole sizes and staggering of these holes. Several different types of perforations are available that include circles, squares, hexagons, stars, etc. All of these factors will influence the amount of visibility and openness. One popular consideration is using offset sheets so as to maintain opennes but to eliminate any visibility. This design is also popular with varying colors of sheets. Expanded metal. This punched metal sheet provides real security but allows considerable visibility and openness. The openings can vary in both width and height. Expanded metal is available in both raised and flat sheets. Slats. Solid or tubular slats are another popular mechanical equipment screen. Slats may be installed horizontally, vertically and diagonally. The width and thickness of slats and the spacing between the slats may vary providing more or less visibility or openness. Slats may also be installed in a shadow box pattern that allows almost no visibility but considerable openness. Other mechanical equipment screening options include solid sheet and wire mesh. Clearance. Most mechanical equipment manufactures will clearly state an unobstructed area to be maintained around the equipment and the degree of openness in any screening. Please consult the equipment manufacture installation and maintenance documents. Even if the manufacture does state a minimum clearance around equipment, designers will also want to consult local codes for this same requirement and plan for the greater of the two. Access. Consult local codes for access requirements specific to mechanical equipment enclosures. Typically, a code specified door or access portal is placed on the control side of the mechanical equipment. Doors will almost always open out so plan accordingly. Individual vs. continuous screens. Some local codes may specify a single continuous screen in some applications versus multiple individual screens. Please check your local codes for requirements. Openings. Engineers and architects should identify any vents, ducts, piping and electrical wiring that may be accessing the equipment and design screening around these perforations. The location of these items and size should be accurately communicated to screen fabricators so that they may shop fabricate appropriate framed openings for these items. Parapet walls. 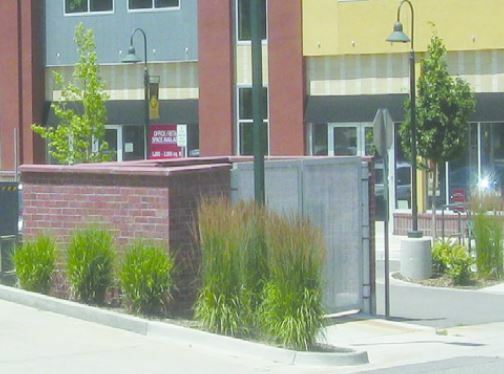 If there are existing parapet walls around the rim of the building, designers may want to use this wall to raise and limit the amount of screening required. After checking local equipment enclosure codes, designers will want to identify all lines of sight respective of any parapet walls. If you have checked-off all of the above items on our user friendly how to guide for selecting your mechanical equipment screening; you are now ready to contact your equipment screening manufacturer. Provide them with all of the above information and allow them the opportunity to assist you in your final layout, design and selection of materials. You should expect your designers’ to provide you with a full set of layout fabrication drawings, elevation views, engineering and product details specific to your project. 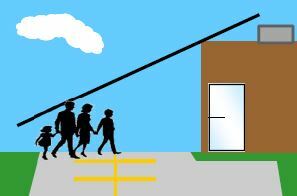 Use these drawings in support of your permit and approval by community planning authorities.